This is the final in a three-part series on avoiding research regret and delivering insights that get action. In the first two installments, we reviewed the root causes and costs of research regret. We also shared a case study about Jason, the Insights Director for an ice cream manufacturer, and revealed why complete clarity on the business problems and opportunities before research begins is so critical. It’s the only reliable way to deliver insights that get action. In this post, we’ll reveal ways to avoid research regret. 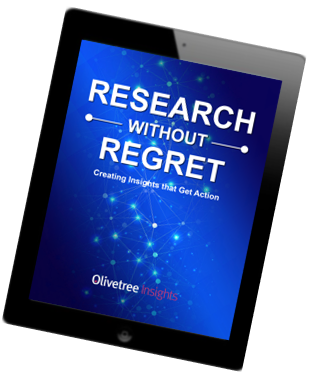 Download our free ebook, Research Without Regret for more tips to end research regret and deliver actionable insights. Albert Einstein said, “If I had an hour to solve a problem, I’d spend 55 minutes thinking about the problem and 5 minutes thinking about solutions.” Albert would have made a great insights professional. Every research professional knows that it’s important to align research with business needs. Otherwise a vaguely defined study can lead to poor quality results. But how research is aligned with business needs varies widely. Some research departments rely on informal probing and others utilize a more formal insights brief process. At Olivetree Insights we interviewed corporate insights leaders to identify best practices. We discovered that more rigorous approaches for aligning research with business needs were more effective in yielding actionable insights. In fact, a rigorous approach tended to result in fewer projects per researcher over the course of a year and a more selective focus. So, let’s look at the key technique that Jason could have used to avoid his research regret. All skilled craftsmen have a set of go-to tools in their toolbox. The Power Dozen Checklist questions are your power tools. And as Atul Gawande explains in his book, The Checklist Manifesto, well designed checklists improve outcomes no matter how expert you are in a subject. Checklists improve efficiency, consistency, and quality in fields as diverse as healthcare to aviation. When used properly, checklists are not just a ‘to do’ list, they are a powerful communication tool that can connect interdisciplinary team members around complex tasks. For example, you might start by asking your business partners “What is the current situation that is triggering the request for research /analysis?” This can be a good lead-in for probes related to the business objective(s) being addressed (e.g., improved profitability, increased sales through market extensions). Next, add dimension to the business objective by defining how the information will be used, whom in the organization will be affected (and might need to be brought into study design), and the existing beliefs regarding the possible results. Once the business objectives are clear, it’s time to move on to the research needs. The remaining questions focus on clearly defining the research objectives and how they will meet the business needs. First, start by considering what’s currently known about the focus area. This enables the team to avoid duplicating prior efforts while leveraging past learnings. Once this is done, the research/analytics objective converts the business objectives into research language. The final items on the list clarify the research objectives in more detail. Download our ebook to get the Power Dozen Checklist and more ideas for avoiding research regret. The Power Dozen Checklist has been field-tested and proven to work. 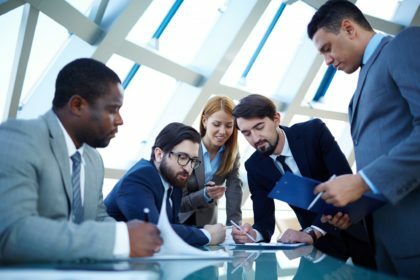 Corporate researchers who’ve used this checklist methodology report improved dialogue that assures that all parties in a study/analysis are on the same page when it comes to objectives, methodology, and deliverables. Ensures that the study results adequately serve the primary business needs. Reinforces a more efficient use of funds and resources for limited research dollars. Confirms that decision makers and stakeholders are prepared for potential results (positive and negative) in advance. Brings more consistency across the Insights Department – so all team members can perform at the same high level and your stakeholders know what to expect when engaging with the Insights team. Patrick clearly missed unstated expectations that weren’t revealed until the report was presented. If Jason’s team had known that brand leadership expected the chocolate latte macchiato flavor to lead the pack because it was an award winner, he could have discussed the differences in expert versus consumer judging of flavors during the design and the reporting stage of the project. An exploration of what’s NOT to be included in a project can reveal underlying, unstated assumptions. In fact, what’s left unsaid can contribute to misunderstanding as easily as something that is misstated. In Jason’s case, an exploration of what’s out of scope might have revealed that competitive flavors should have been considered as part of the study. Identifying what is out of scope is critical to avoid misunderstandings about deliverables. It also eliminates some of the second guessing that can happen at the end of the project. “We should have asked…” regret is replaced with actionable insights. It’s time to stop regretting and start getting action on your insights. Want to learn more about how Olivetree Insights can help you research without regrets? Our proven technology can align your insights to better support business needs. Find out how. Email us at ask@olivetreeinsights.com or call (513) 321- 3483 and arrange for a free demonstration today.